Advice on getting a certain look. Thread: Advice on getting a certain look. I'm still pretty new to using digital painting in general. I was wondering if anyone could give me suggestions on tools I would use in Painter to achieve this look and maybe if possible a theory on the process involved in recreating this look. It looks like water color to me but when I use digital watercolors I just cannot get it to look like this. Also, one of my friends suggested I use a paper grain.. perhaps a watercolor paper one. What do you guys think? It has that really soft watercolor feel which i like. Last edited by Clem111; January 30th, 2009 at 09:01 PM. nice... so you think painter is unable to achieve the same look huh? interesting. Looks like water color and ink to me but either program can be used to get this look. I'm still pretty new to using digital painting in general. I was wondering if anyone could give me suggestions on tools I would use in PS to achieve this look and maybe if possible a theory on the process involved in recreating this look. I bolded what you said that caused the confusion. PS is shorthand for PhotoShop. Doesn't matter, you just want to flat cover and then mask areas for soft and hard edges. Doesn't matter what tool you use as long as it doesn't have Impasto on. Otherwise you'll see effects of raising/lowering of paint. It's also easier if you have a brush that's method is set to cover. Thanks Jason. It looks like watercolor to me too but someone said it looks nothing like watercolor. Arshes Nei - Thanks for that. Edited my post. Appreciate the advice too. I'll give it a try. How do you mask areas for soft and hard edges? I guess I'll look at the help file too to see what they say about masking. Hi Clem111 Maybey play areound with the airbrush tool. You can achieve the above if you mask areas off to get crsip edge and similar techniques with the shadowing. Give that ago and see if you like it. ehm, in Painter I would use hard round brush to lay in the colors and values, then soft airbrush or blender or watercolor to soften it a little. Then you could play with textures and or noise to get a similar look. Hmm i never thought about using textures but have used noise and thought it worked pretty well. Thanks for reinforcing that idea. At least I know I was thinking in the right direction. I'll give soft airbrush a try. Thanks for the advice Hive mind! I have that artbook and I know the artist "Bengus" aka CMRK uses Photoshop, that's just a round brush set to opacity and size, the texture you're seeing is actually from the paper it was printed on but you can load a noise texture, set it to overlay and you'll get a similar effect. Yep the artist is indeed the illusive bengus. I wish he would have an artbook of just his stuff. Which artbook do you have? I thought I got most of them and I didnt see this illustration in there. Maybe I'm missing one. I'll definately give the round brush a try though. thanks Portus! The Hulk would clean house in that pic anyway. 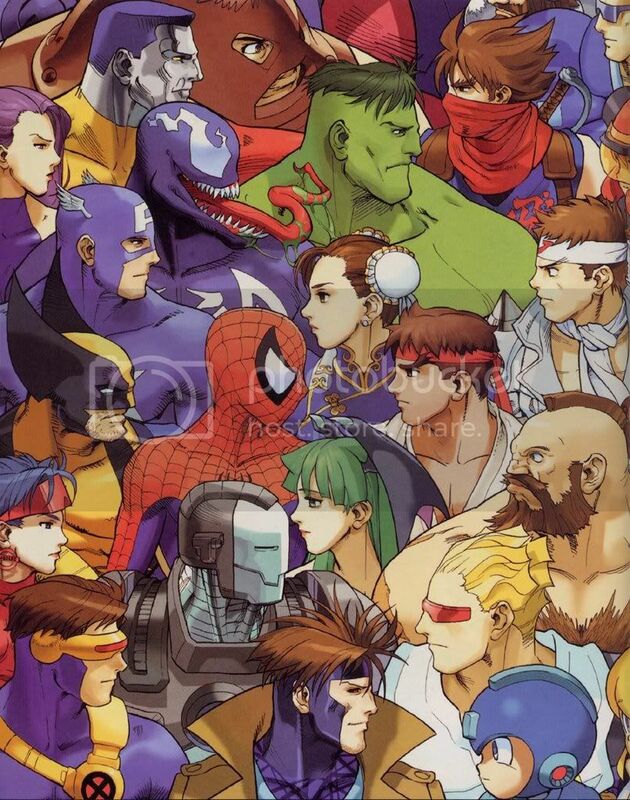 It was published on Capcom Design Works, it's easy to get and is filled with this artist's work.